This is the second of three posts required of food bloggers who attended the 2014 IFBC conference in exchange for a lowered conference fee. I determine the content and receive no compensation or gifts for mentions of products or organizations. I left my real camera at home this year when I attended the International Food Blogger Conference. Giant rooms with overhead lighting can be a challenge without a full format camera and I was going this year for the writing workshops anyway, I reasoned. Setting off with only my phone, a notebook, and business cards felt lighter, if a little risky. I was going to network, reconnect, and learn: better to focus on experiencing rather than documenting the weekend. The trade-off, of course, is a dearth of images to accompany my thoughts. I don’t, for instance, have photos of the fresh peaches I received from the Washington State Fruit Commission. I ate one (or was it two?) out of hand and took a round, ripe one to the friend who hosted me for the weekend. That put me in a good mood: fresh is the best kind of swag. This was a record year for Washington fruits, and the mild weather allowed us to indulge early and savor them (berries and stone fruits in particular) for weeks later than we’re used to in this part of the world. For my part, I ate most of what came my way just like I did those peaches: unadorned and with speed. At home, I did manage one batch of peach jam. It didn’t set up, so it’s destined for the ice cream bowl. That’s alright. It will be a good way to re-live our late, late summer. Last year, I cradled a paper bag of tomatoes on my way back from the conference, on the train, a gift from my friend Janelle. 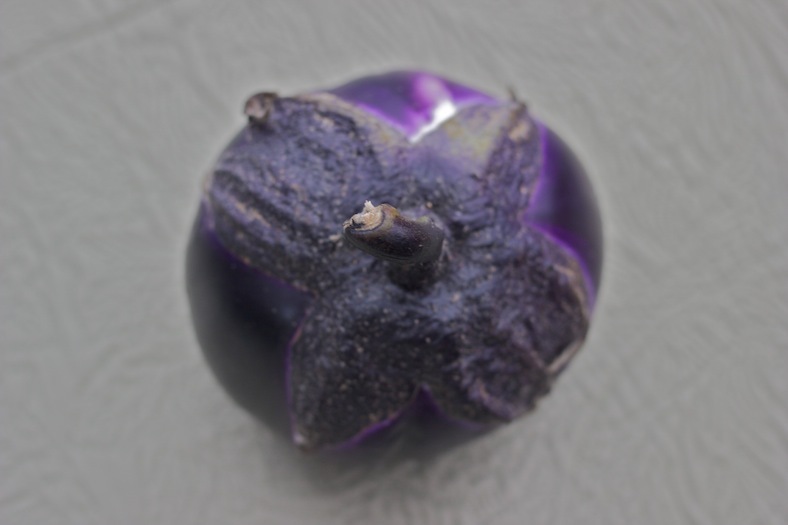 This year, the good folks at Farmstr, her startup, outdid themselves, handing out gifts like a hyacinth-purple eggplant that, when I pulled up part of its crown, was blanched white. The flesh inside was a creamy color, too, and a dang fine base for a baba ghanoush that was so well received (read: devoured), I didn’t have time to take a picture. I swear, my daughter can eat that stuff with a spoon. 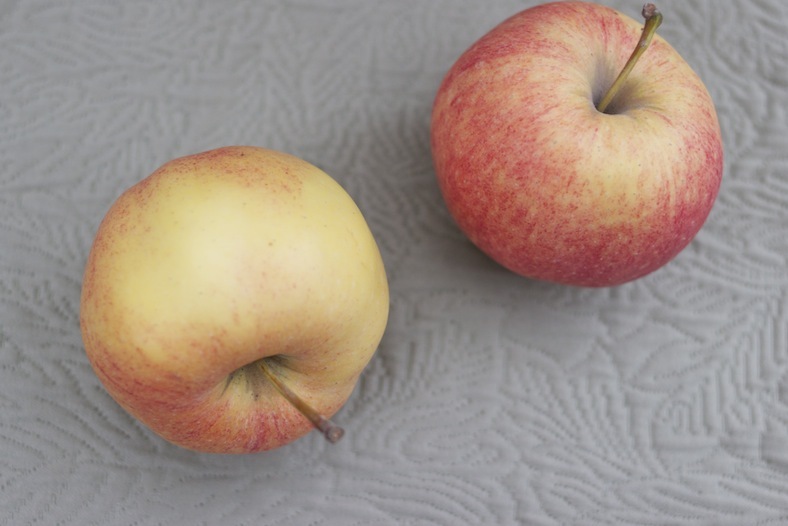 There were rosy apples, too, and a special Petit Gris de Rennes melon that had a musky lilt to its flavor that matched, I thought perfectly, its dusty exterior. 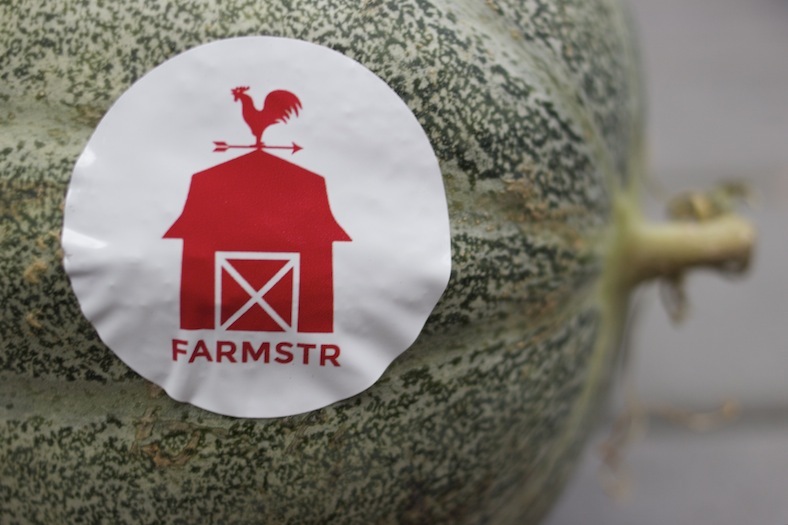 If you live in Seattle, get signed up for Farmstr’s weekly hotsheet. 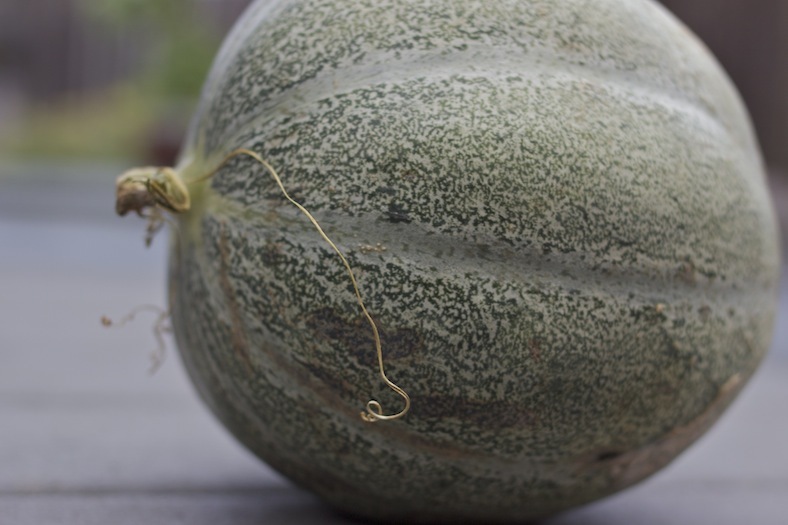 In it, you’ll find pastured meats, farm fresh eggs, salmon, greens, garlic, honey…and that’s just this week. 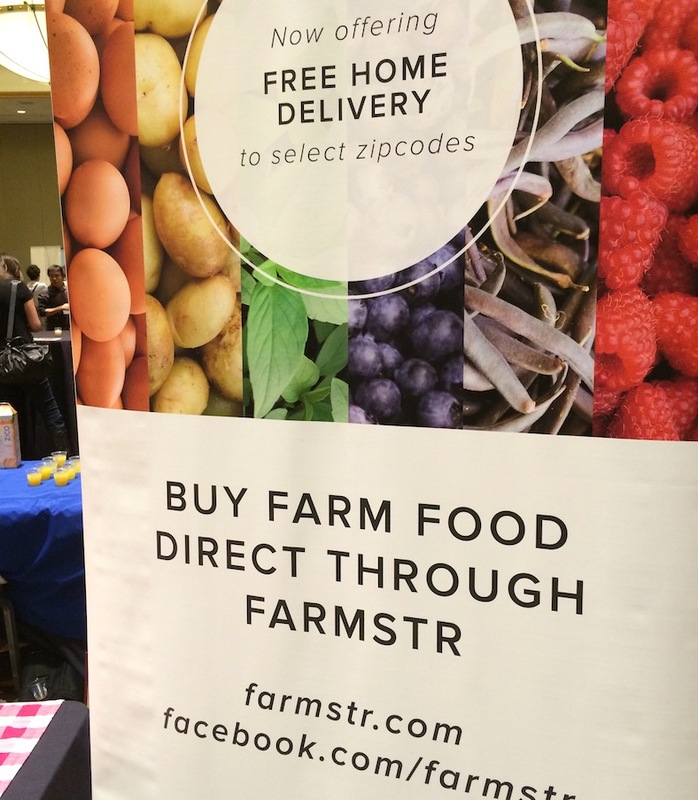 It’s a great way to ensure that the money you pay for local food finds its way back to the people who grew it. 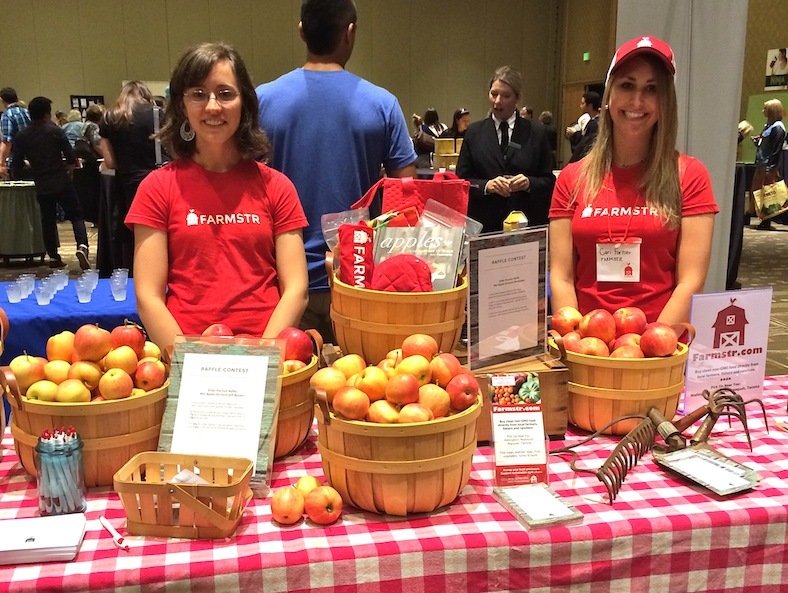 This entry was posted in Conference, Fall Fruits, Fall Vegetables, Summer Fruits and tagged Apple, Eggplant, Local, Melon, Organic, Peach. Bookmark the permalink. I’m so happy Janelle’s start-up is doing so well! Yes, I switched things up a bit. And thanks!